The person of the week for this week is Bishop Æthelwald of Lindisfarne, one of the possible owners of the Prayer book of Æthelwald in the Book of Cerne. Bishop Aethelwald of Lindisfarne first enters the historical record in Bede’s Life of Cuthbert, where is said to have been one of Cuthbert’s retinue and currently Abbot of Melrose. Later when Bede writes the Ecclesiastical History, he refers to Aethelwald, former Abbot of Melrose, as the current Bishop of Lindisfarne. So he appears to have been marked for leadership in the Lindisfarne-Melrose community as early as the 680s. Aethelwald would have been present in the community during the entire period from Cuthbert’s episcopate to the establishment of his veneration, compilation of his lives, the Lindisfarne Gospels to honor St Cuthbert, and last but not least the establishment of Boisil as the saint of Melrose. 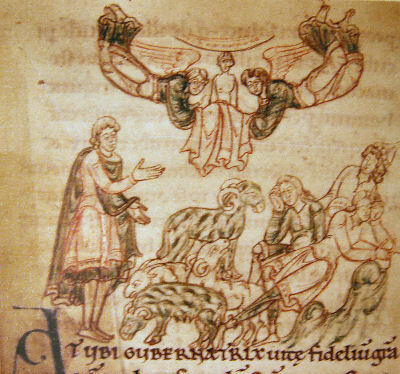 In the Life of Cuthbert, Bede cites Aethelwald as a witness to a miracle of St Cuthbert. This all suggests that Aethelwald’s family was from northern Bernicia or even Lothian. Northumbrian monasteries in Lothian (near Abercorn) were abandoned for fear of the Picts after Ecgfrith’s death at the battle of Dunnichen in May 685. Bishop Cuthbert must have been very active in relocating the monastics and other English settlers who had moved into Lothian and southern Pictland during Ecgfrith’s reign. In the Ecclesiastical History, Bede refers to King Aldfrith’s visits to Melrose during Æthelwald’s tenure as abbot. The hermit Dryhelm was active at Melrose during that time and King Aldfrith could come to visit with Dryhelm, who had after all previously been a noble. We don’t know which monasteries King Aldfrith favored, but Lindisfarne and its daughter house Melrose are likely. Æthelwald becomes Bishops of Lindisfarne in 724, during the tenure of King Osric son of Aldfrith. He is the only Northumbrian bishop to come through the turbulent 730s without being deposed. During his tenure, King Osric was died on 9 May 729 appointing Ceolwulf as his successor. Bede makes it clear that it was not a smooth succession. The Moore MS of Bede’s History continues the chronology with the note: 731: “King Coelwulf was captured as tonsured and then restored to his kingdom; Bishop Acca was driven from his see” (McClure and Collins 1994: 296). It is unknown where he was tonsured, but it may be related to the expulsion of Bishop Acca of Hexham. King Ceolwulf returned to the throne, but he did not allow Bishop Acca to return, suggesting to me that Acca was probably in league with Ceolwulf’s enemies. When Ceolwulf did voluntarily enter a monastery, it was Lindisfarne during the time of Bishop Æthelwald. Ceolwulf’s death was recorded in Irish sources as under the name Eochaid. It is possible that like King Aldfrith that may imply an Irish mother, or that he took the name after he entered the Irish-influenced monastery, although others at Lindisfarne were not known for taking Irish names. It seems likely that Ceolwulf may have been born during Aldfrith’s reign when relations with Dalriada were the best since before the synod of Whitby. So anyway, it is significant that King Coelwulf chose to take the tonsure from Bishop Æthelwald, rather than Bishop Egbert of York, whose brother he named as his successor. It was Bishop Æthelwulf’s successor Cynwulf who gave King Aldfrith’s son Offa refuge from King Eadbert and paid a heavy price for it. It is worth noting that King Ceolwulf was still a monk at Lindisfarne when Offa took refuge there in 750. Coelwulf did not die until 764-765, so he must have been quite young when he abdicated. Aside from politics, pious Bishop Æthelwald was involved in the production of several manuscripts. According to a 10th century note in the Lindisfarne Gospels (left), Æthelwald had his predecessors work bound into the gospel book and commissioned its jeweled covers. 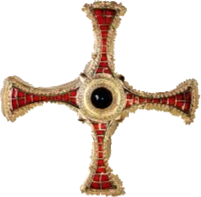 Symeon of Durham claimed that Æthelwald continued to build up St Cuthbert’s veneration by commissioning a stone cross in memory of St. Cuthbert. A hymnal from Fulda called the Ympnarius Edilwaldi may have belonged to him. It has since been lost but it may have been the source from some hymns from Bede in Germany. It has also been suggested that the ‘Prayer book of Æthelwald’ bound in the Book of Cerne belonged to him. This book contains a number of Irish influnced prayers and an abbreviated psalter using the Old Latin Psalter (unlike Bede’s use of the Hebraicum). Update (1/22): I forgot to mention that Æthelwald is considered the last saint of Lindisfarne. When the community left Lindisfarne they placed some of his bones in the coffin of St Cuthbert for their long migration eventually to Durham. He was also an informant for the Anonymous Life of Cuthbert written in c. 704. Farmer, David. Ed. Age of Bede, Penguin. Judith McClure and Roger Collins, eds. 1994. Bede: Ecclesiastical History of the English People. Oxford UP. Michael Lapidge, John Blair, Simon Keynes, and Donald Scragg, ed. 1999. The Blackwell Encyclopedia of Anglo-Saxon England. Blackwell.